Professor Charles Higham, Department of Anthropology and Archaeology, University of Otago. It was in the late 16th century that Portuguese missionaries discovered the largest pre-industrial city in the world, in the jungles of Northern Cambodia. The city was deserted and much of its story had been lost over time. Uncovering the secrets of Angkor has attracted the attention of the world’s scholars and students throughout the world as its hidden secrets have been revealed using traditional archaeological methods combined with the latest technological developments. One person above all others has made it his life’s work to uncover the story of Angkor. Professor Charles Higham of Otago University was the first professor of prehistoric archaeology to be appointed in Australasia. He has been awarded countless honours for his work in Cambodia and South East Asia. He is a Fellow of the British Academy and a Fellow of the Royal Society of New Zealand. 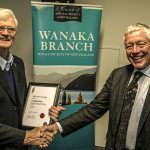 He has recently been awarded the Grahame Clark Medal by the British Academy and the Mason Durie Medal by the Royal Society of New Zealand.